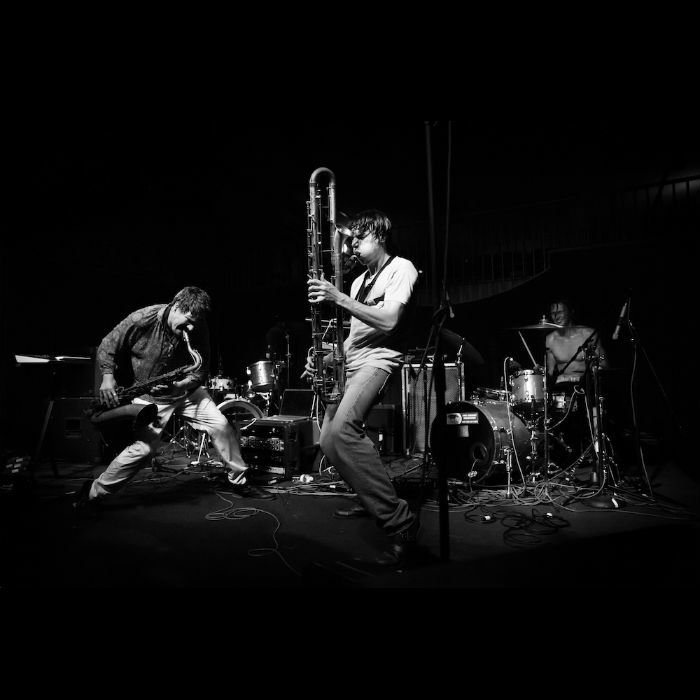 If any band is a poster child for turning the power of positive thoughts and intention into reality, it’s the explosive horn-and-percussion trio Moon Hooch. In just a few short years, the group—Wilbur, fellow horn player Wenzl McGowen, and drummer James Muschler—has gone from playing on New York City subway platforms to touring with the likes of Beats Antique, They Might Be Giants, and Lotus. On Red Sky, their third and most adventurous album to date, the band uses everything they’ve learned from their whirlwind journey to push their sound to new heights, bringing together the raw, transcendent energy of their live performances and the sleek sophistication of their studio work into a singular, intoxicating brew that blends elements of virtuosic jazz, groovy funk, and pulse-pounding electronic dance music. For the members of Moon Hooch, commitments to consciousness, environmentalism, veganism and philosophy and peace aren’t separate from their commitment to music, but actually integral parts of it. It’s all tied into that same core approach that led to their discovery on the subway platform: try to make the world less like it is and more like you wish it could be. Moon Hooch tries to live up to their green ideals while traveling as much as possible, playing benefit shows, supporting local farmers and co-ops, participating in river cleanups and more. The band even runs a food blog, Cooking In The Cave, in which they highlight the healthy, sustainable, organic recipes they utilize with their mobile kitchen setup on tour.